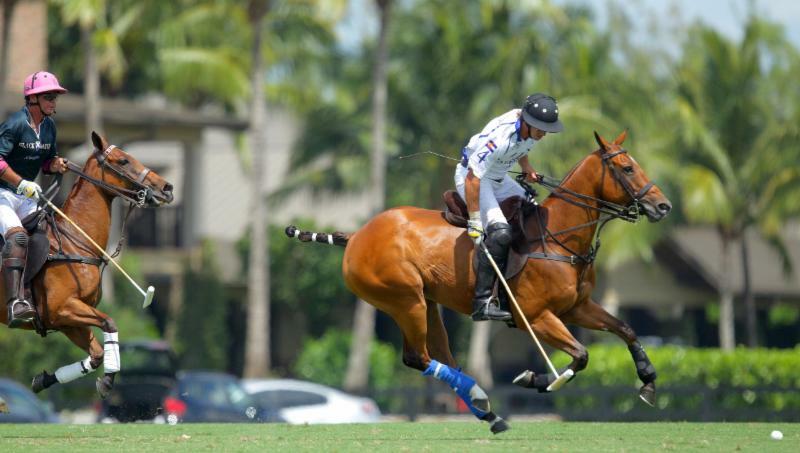 WELLINGTON, Fl., April 8, 2019----Playing its best polo of the World Polo League, Audi will join Colorado, Grand Champions and Valiente in the Triple Crown of Polo semifinals on Thursday. Audi (Marc Ganzi, 2, Nic Roldan, 8, Pablo MacDonough, 10, Kris Kampsen, 6) defeated WPL (Poroto Cambiaso, 3, Guillermo Terrera, 8, Agustin Nero/Santi Torres, 6, Diego Cavanagh, 9), 10-6, Sunday at Grand Champions Polo Club. Pablo MacDonough of Audi avoids the hook of Diego Cavanagh of WPL. 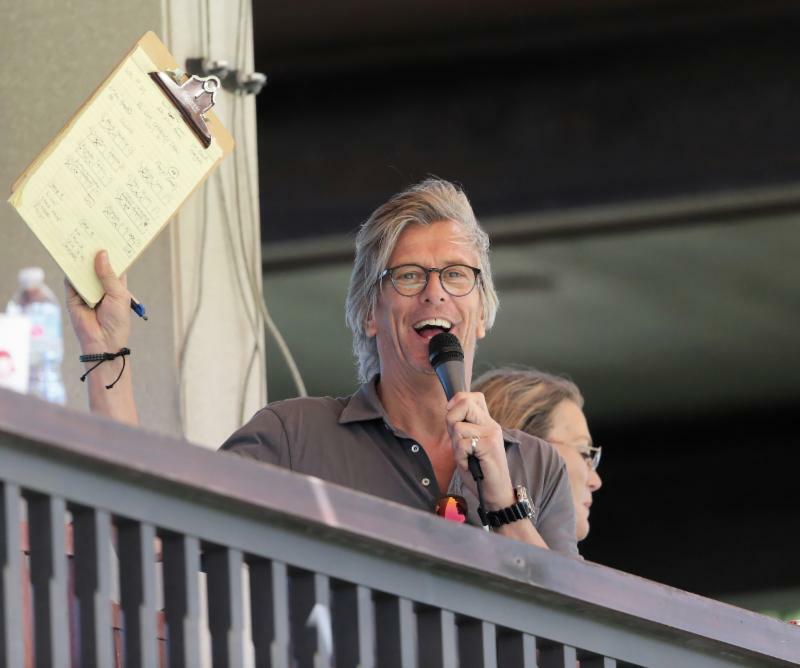 Leading 5-4 at halftime, Audi outscored WPL, 5-2, in the second half, and held them scoreless in the fourth and sixth chukkers to remain unbeaten (3-0). 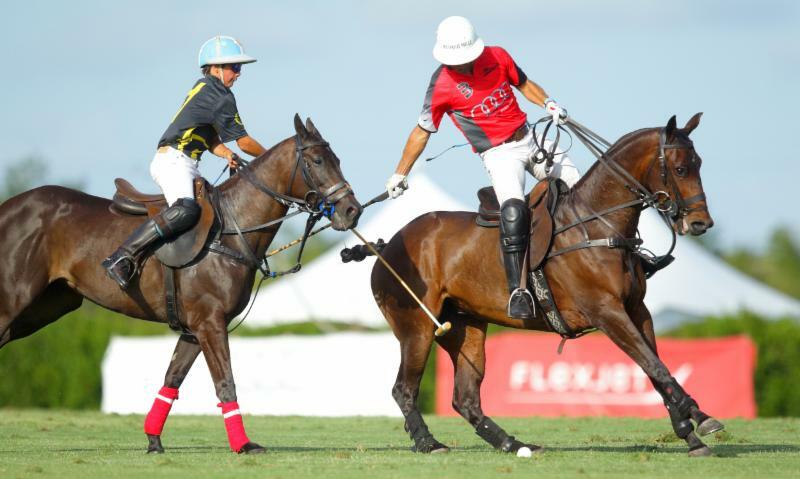 Audi will play Valiente, 13-10 winners over Black Watch, in Thursday's first semifinal. Undefeated Colorado (3-0) will play Grand Champions (2-1), 14-13 winners over Mandarina, in the other semifinal. Nic Roldan of Audi goes for the big hit downfield with teammate Kris Kampsen backing him up. "I think we played well today most of the chukkers," said Most Valuable Player Pablo MacDonough, fully recovered from an ankle sprain he sustained against Grand Champions. "We played the way we wanted. We have been playing together for two months now and we know each other on the field. 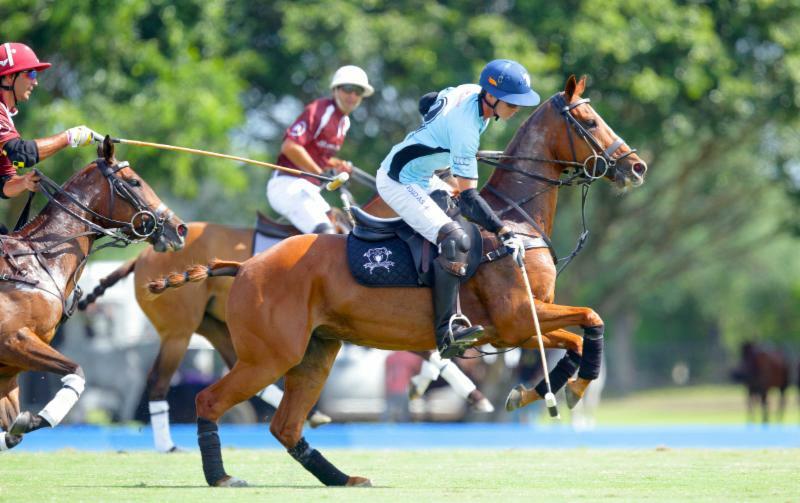 Poroto Cambiaso of WPL hooks 10-goaler Pablo MacDonough of Audi. "We had a few mistakes in the middle where we rushed a bit," MacDonough said. "We are in the semis, that's good. Now hopefully the horses stay well for a few more days. 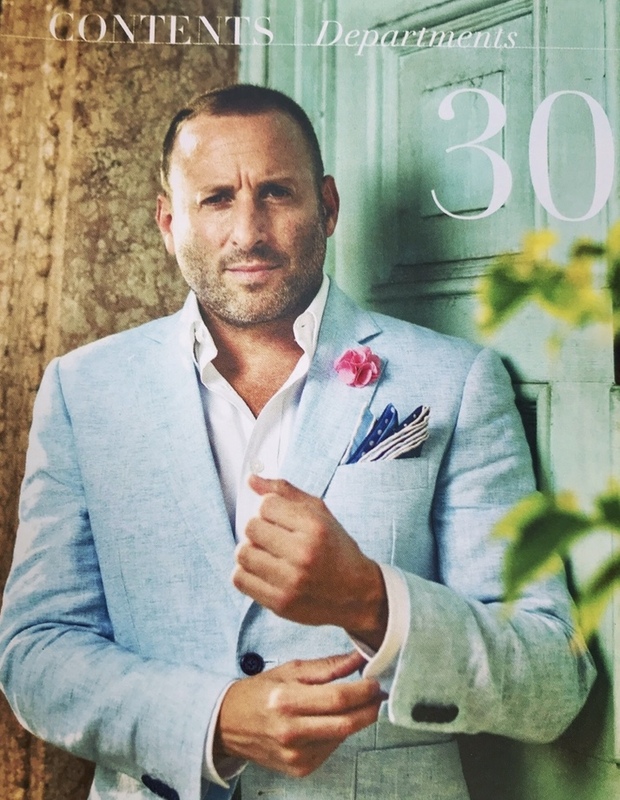 It's really important for us to have them in good shape, fresh and 100 percent." Kris Kampsen of Audi on the defensive. MacDonough scored a game-high six goals including five on penalty conversions. Nic Roldan added two goals and Marc Ganzi and Kris Kampsen each had one. Diego Cavanagh scored three goals for WPL. 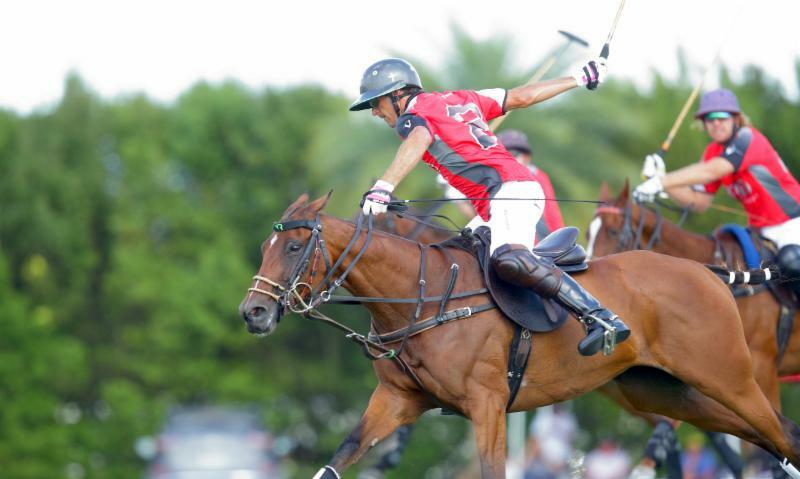 Terrera had two and Cambiaso added one goal. "The game got really tough. Obviously, those guys are a great team and they lost their key player and had to put a sub in at the last second but he played great," Kampsen said. "It's never easy jumping in the last minute. Poroto Cambiaso of WPL outraces Nic Roldan of Audi downfield. "This was a huge win. Pablo was great about keeping our heads in the game. It's very important for us to be in the semifinals. It's important to get back in the final. I want to win with these guys. I want a chance to win." Nic Roldan of Audi hits a back shot past Guillermo Terrera of WPL. 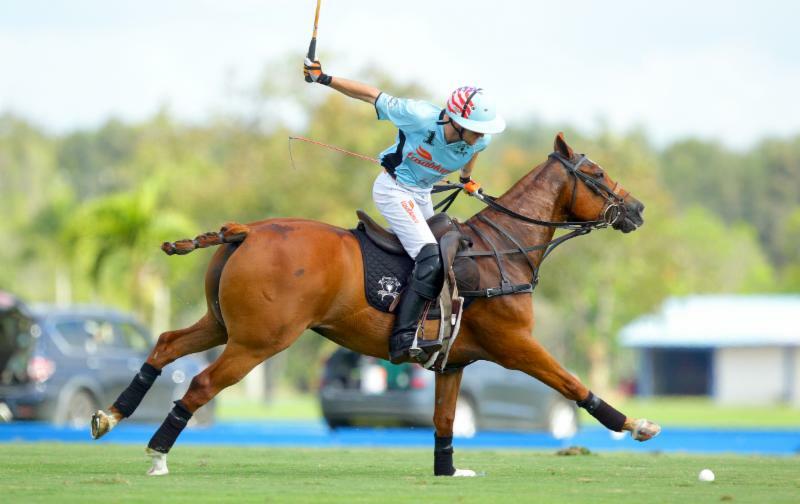 Six-goaler Agustin Nero of WPL was injured in the opening chukker when he tried to ride off Nic Roldan, both taking out the goal post. 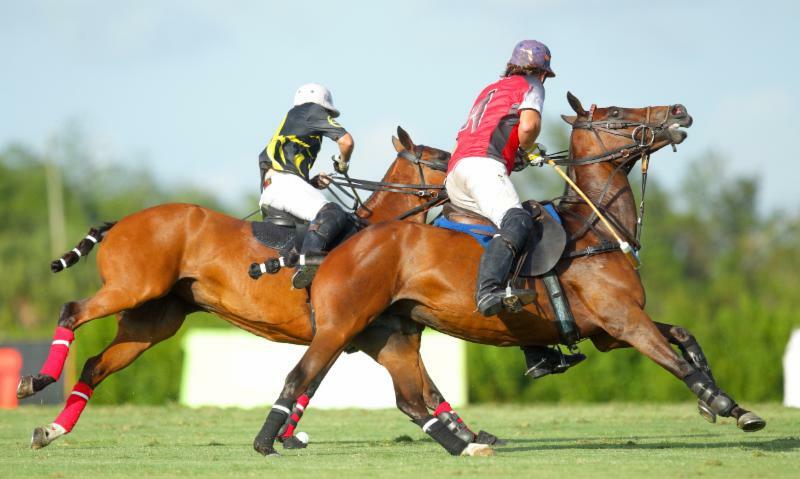 Nero returned to the game briefly before being replaced by 6-goaler Santi Torres of Valiente in the second chukker. Torres played with a different helmet until a friend brought his trademark bright red helmet to the players' tent for him to switch. Pablo MacDonough of Audi works the near side shot with Diego Cavanagh of WPL defending. Torres had already played in the Valiente-Black Watch game earlier in the day, but Audi team sponsor Marc Ganzi and his players agreed to allow him to play again. "We just thought it was good sportsmanship," Ganzi said. "This is the beauty of the World Polo League. That's the idea, the idea is to make sure everybody understands that it's a privilege to play this game. It's a game at the end of the day, a game among gentlemen. If we forget that's what the purpose of the game is, then we have all lost our compass about why this is what it is. I am really happy with the sportsmanship in the league and very pleased with how far we have come as a league in one short year. I think we have shown people a lot." 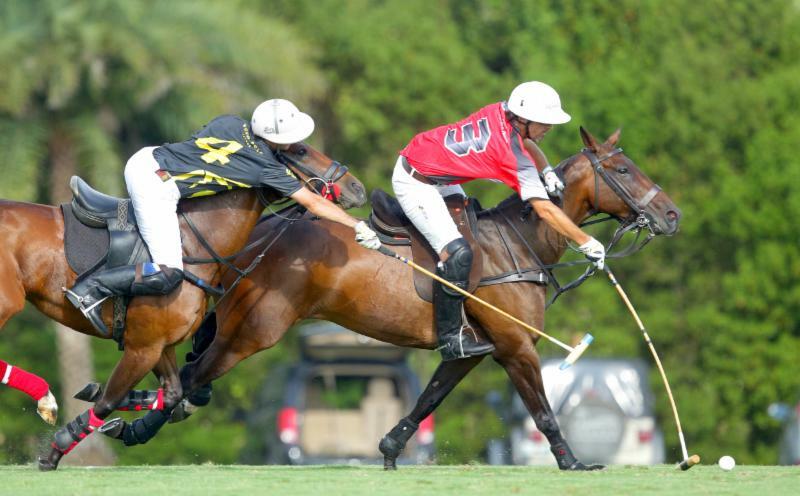 Santi Torres of Valiente hits away as Juan Cruz Merlos of Black Watch defends. 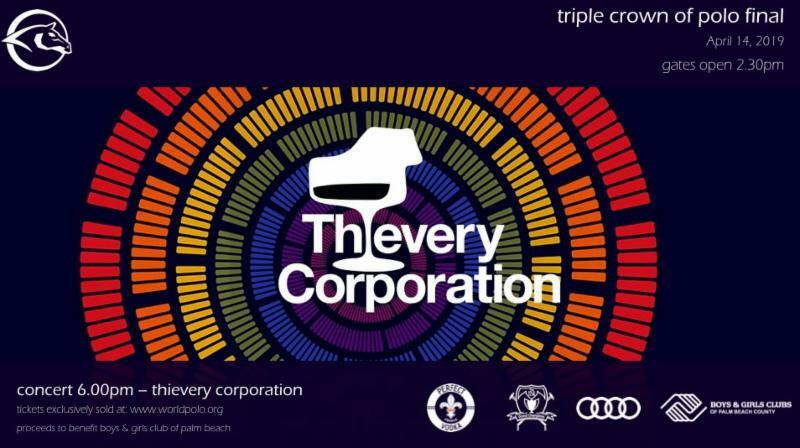 In the last two tournaments, Audi has gone from winless in the Founders Cup to finalist in the Palm Beach Open. "We talked about how important this game was," Ganzi said. "The pattern of polo that's working for us right now is being super disciplined and playing good defense which is not usually what we do. Pablo has us thinking defense first. When we defend well, we play well." Juan Bollini of Black Watch chases down Alejandro Taranco of Valiente. 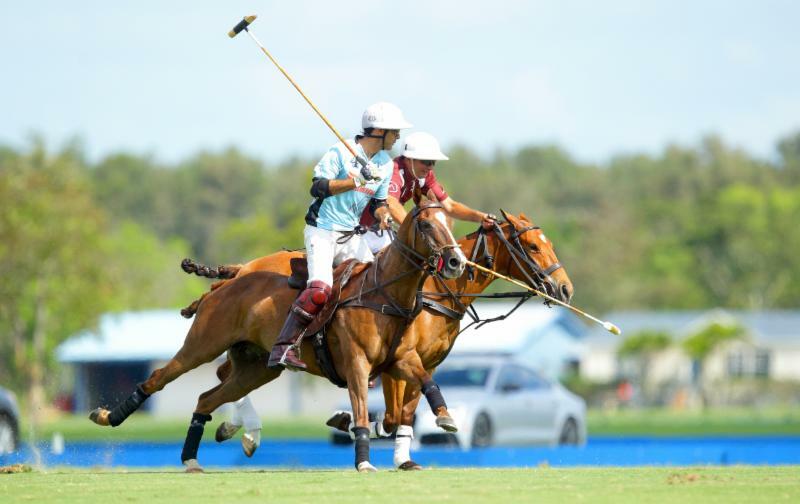 Audi jumped out to a 3-0 lead in the opening chukker and maintained its game plan working together well as a team for most of the game leading 4-3, 5-4, 6-4 and 8-6. "I am very happy," Ganzi said. "Each game we get better. I like it when we play error-free polo. We made a couple mistakes today. Whether it's defending a man with security or it's delivering the ball with security, I think we are hard to beat." 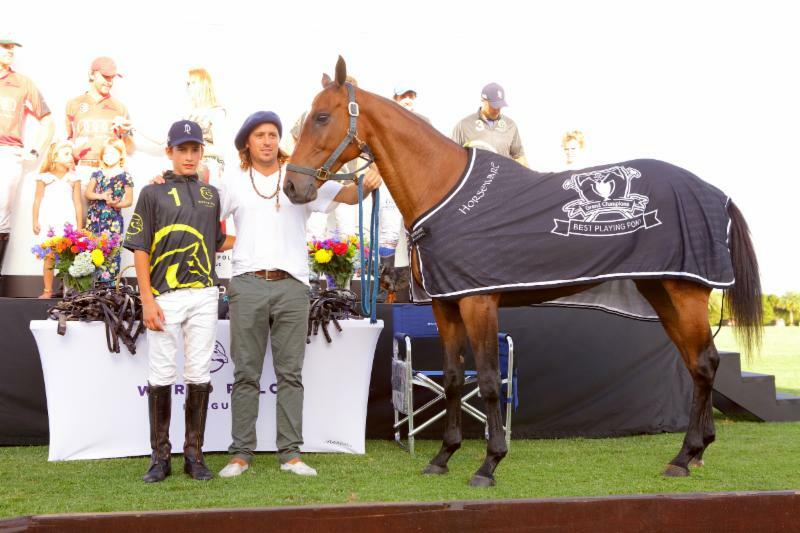 Grand Champions Best Playing Pony, Cuban, played by Poroto Cambiaso of WPL. 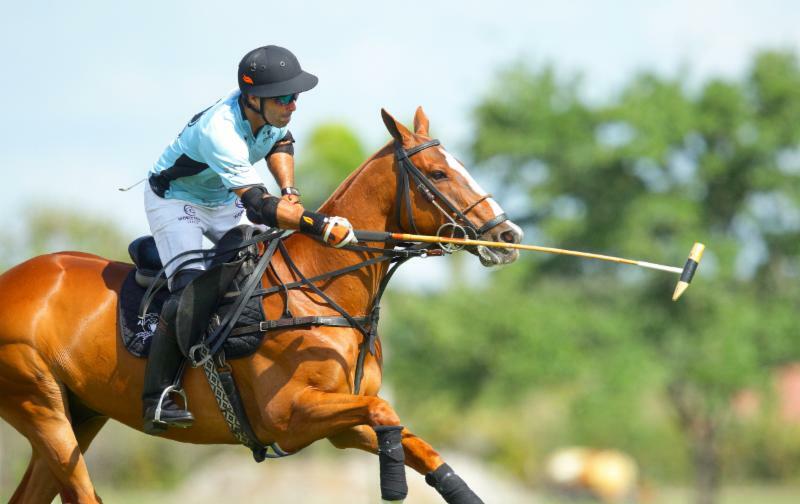 The Grand Champions Best Playing Pony was Cuban, played by Poroto Cambiaso of WPL. 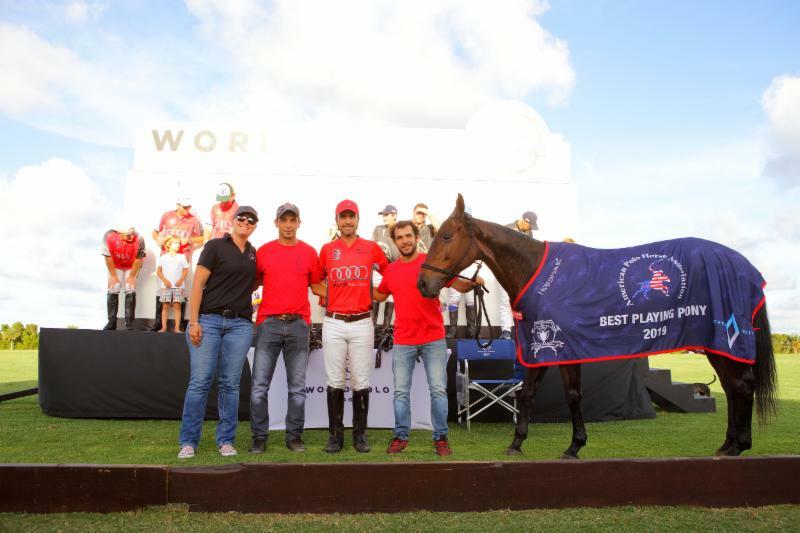 The American Polo Horse Association Best Playing Pony was Irenha Pizza played by MVP Pablo MacDonough of Audi. 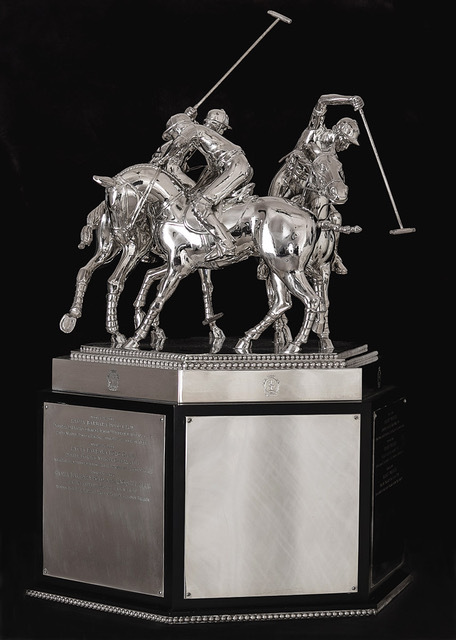 American Polo Horse Association Best Playing Pony Irenha Pizza played by MVP Pablo MacDonough of Audi. 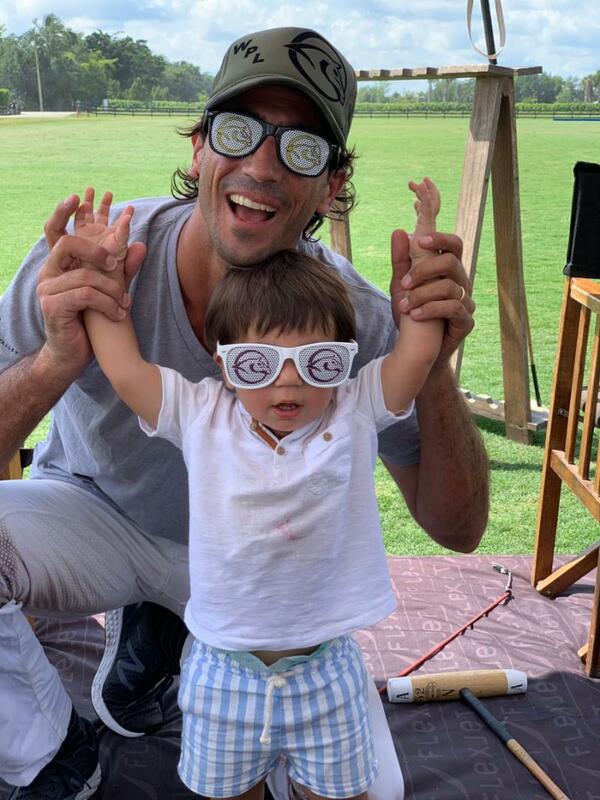 Valiente (Bob Jornayvaz, 2, Santi Torres, 6, Pelon Stirling, 10, Alejandro Taranco, 8) needed only one chukker to overcome a 3-0 deficit Black Watch (Juan Cruz Merlos, 6, Nacho Figueras, 6, Pite Merlos, 8, Juan Bollini, 5) received on handicap and 4-0 lead early in the first chukker. 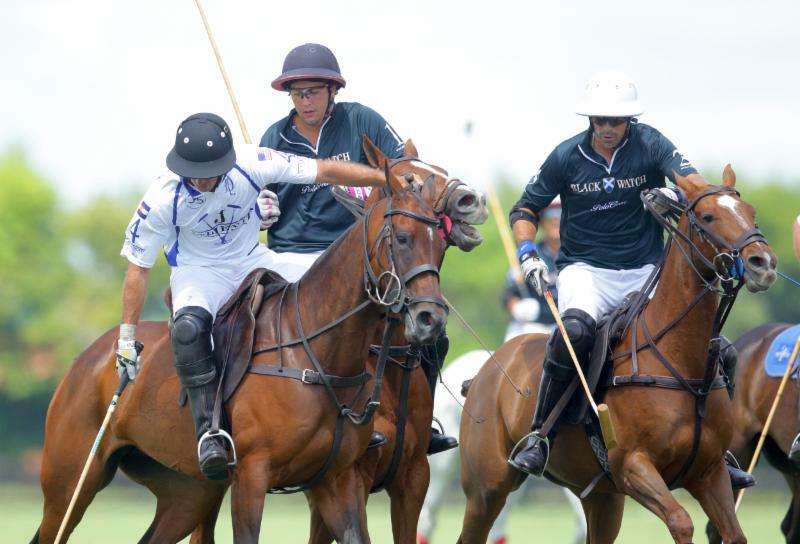 Alejandro Taranco of Valiente works the ball despite being double teamed by Black Watch teammates Juan Cruz Merlos and Nacho Figueras. 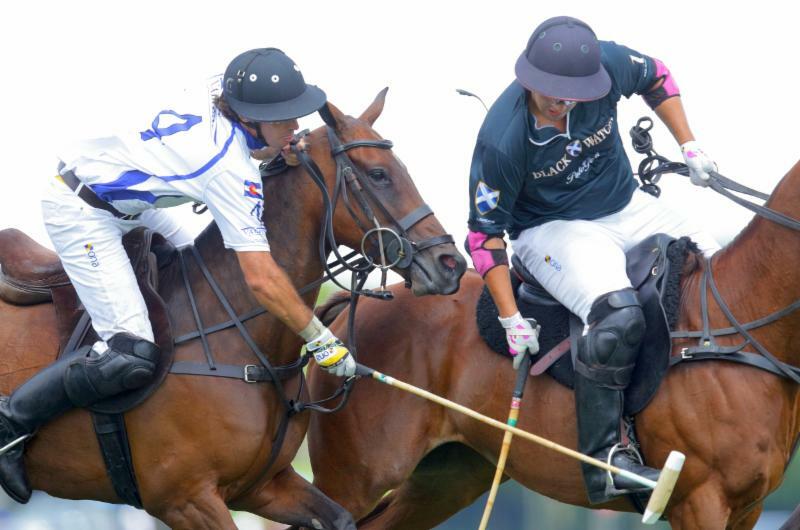 Valiente shut out Black Watch, 4-0, to take a 7-5 lead and never relinquished the lead. Black Watch cut the lead to one, 9-8, after the fourth chukker but Valiente pulled away in the fifth chukker. "They played well today, they are definitely playing better," Jornayvaz said. "It was a fun game to be in. Juan Bollini made a big difference. He is a long ball hitter and did a great job opening it up for them. Alejandro Taranco of Valiente hooks Juan Cruz Merlos of Black Watch. "It's fun that I have played with all these guys so many times and they know what I can do and can't do," Jornayvaz said. "They make up for all the things I can't do. It's fun, it worked out well. It's great we are in the semifinals." Stirling led Valiente with a game-high eight goals including six on penalty conversions. Taranco added three goals and Jornayvaz and Torres each had one. For Black Watch, Juan Cruz Merlos and Figueras each had three goals and Pite Merlos added one goal. 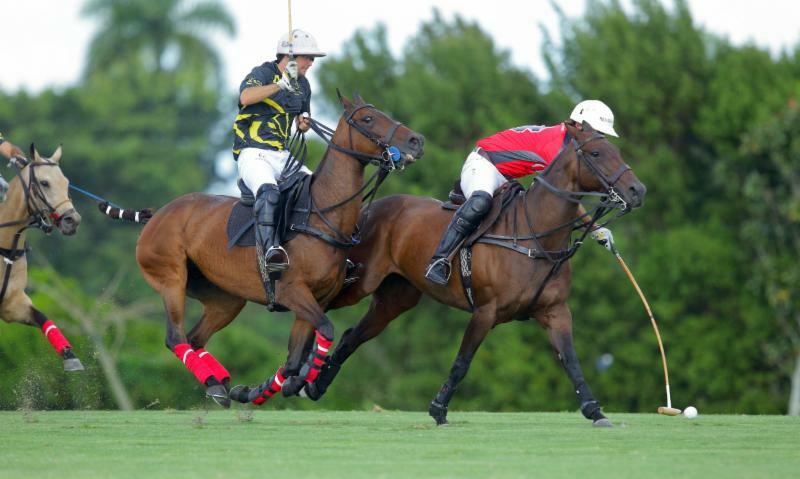 Bob Jornayvaz of Valiente defends Pite Merlos of Black Watch. 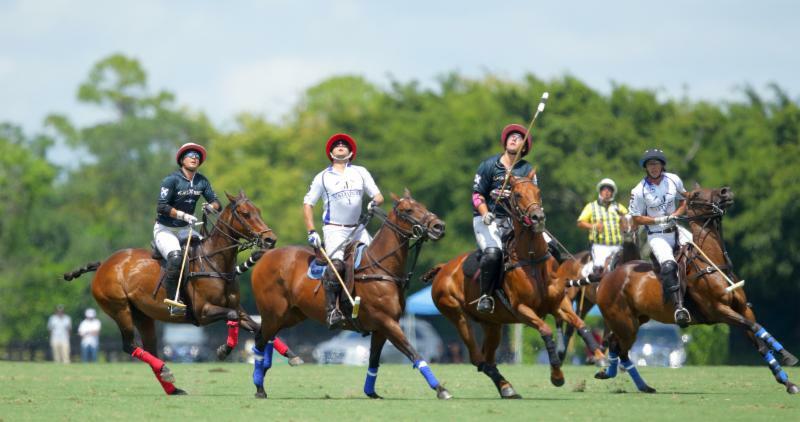 In the first game of Sunday's tripleheader, Grand Champions started out with a 5-0 deficit with Mandarina's handicap and fell behind 6-2 late in the first chukker before clawing its way back and tying the game 7-7 on Ganzi's goal with 4:57 left in the third chukker. 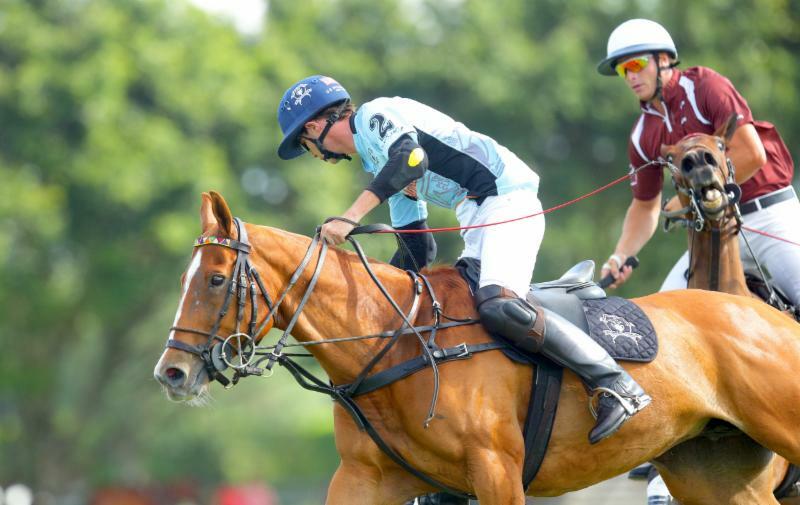 The lead changed hands three times before Grand Champions regained a 12-11 lead on Nero's goal with 3:10 left in the fifth chukker. 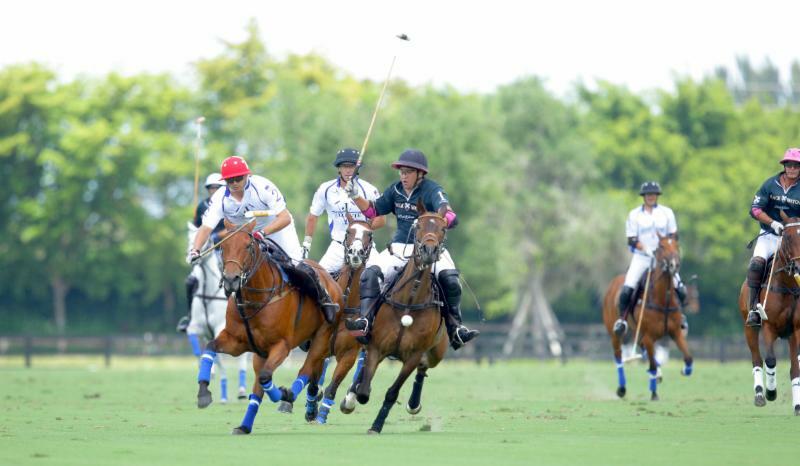 Santi Torres of Valiente and Black Watch father and son Pite and Juan Cruz Merlos keep their eyes on the ball. Grand Champions pulled away for a 14-11 lead with 3:56 left in the game. Biggati's goal in the final two minutes cut the lead to one but Mandarina ran out of time. 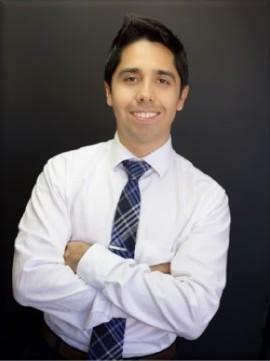 "This is a huge win," Ganzi said. "It gives us a lot of confidence going into the semifinal. This game was more to play for the team just to get some chemistry back. We kind of got a little lackadaisical the last game. We were a little loose. Everything that could have gone against us went. It was really tough. Rodrigo Andrade of Grand Champions passes to teammate Juan Martin Nero. "Going into the semifinals the horses are good and the team is good. We just need to keep our heads on straight." Grand Champions got balanced scoring out of its lineup. 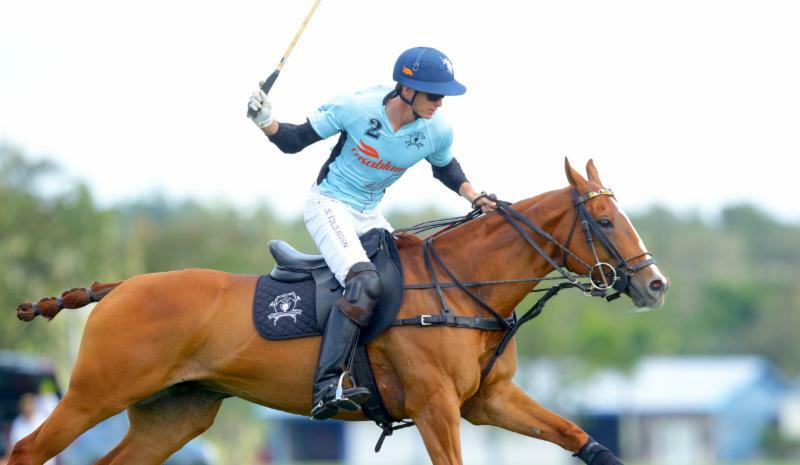 Ganzi had a game-high five goals including a penalty-four in the sixth chukker, Andrade had four goals, Bollini had three and Nero added two. Alfredo Bigatti of Mandarina goes to hook Juancito Bollini of Grand Champions. Melissa Ganzi, playing against her son, led Mandarina with four goals. Bigatti and Novillo Astrada each had two. 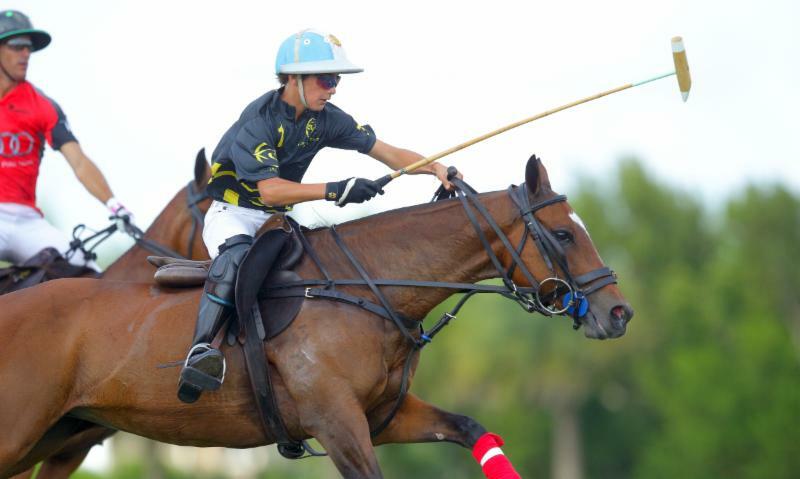 World Polo League action continues on Wednesday with the US Trust Cup subsidiary semifinals. At 10 a.m., Mandarina plays Alegria at Grand Champions Field 1. 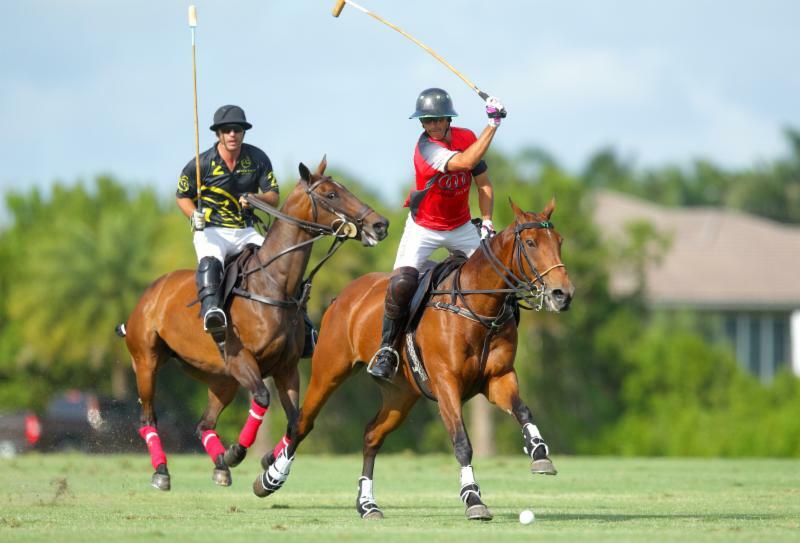 At 3 p.m. Black Watch plays World Polo League at Jan Pamela Field 3. 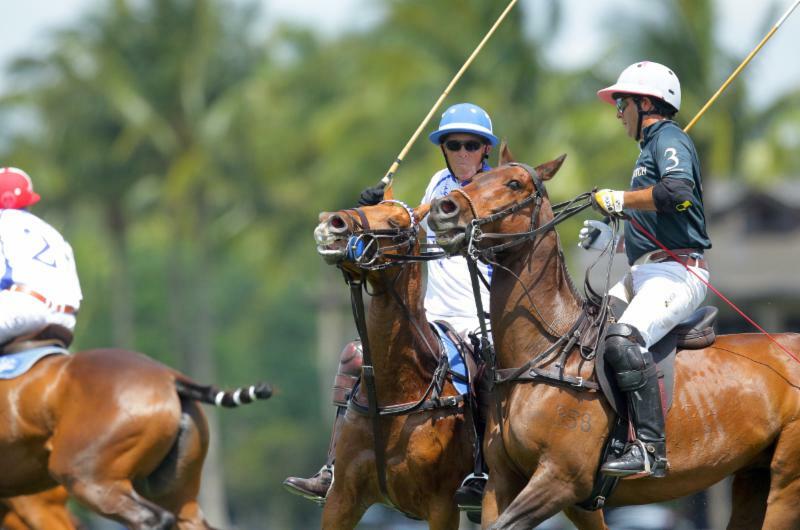 Alejandro Novillo Astrada of Mandarina attempts to hook Juancito Bollini of Grand Champions. 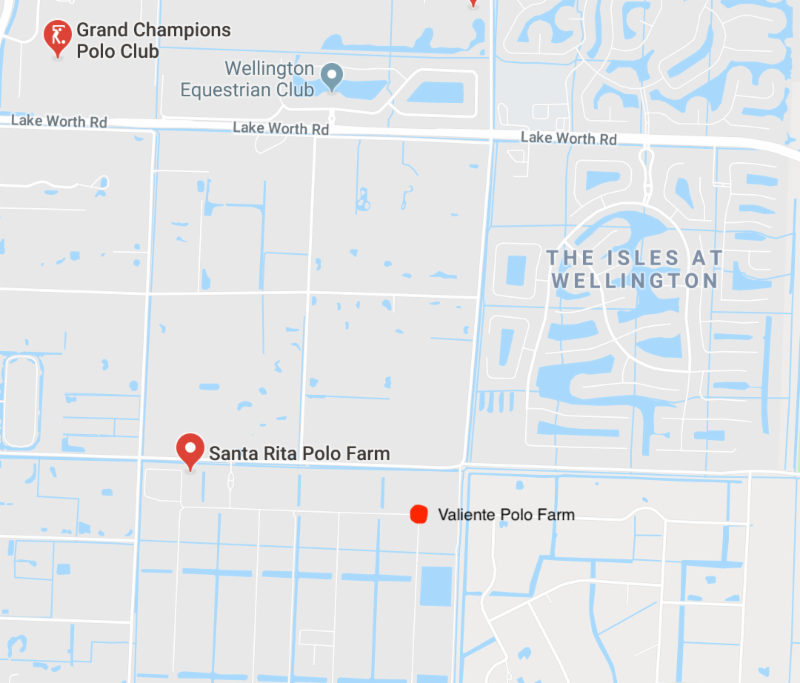 On Thursday in the Triple Crown of Polo semifinals, Valiente plays Audi at 11 a.m. at Valiente Polo Farm Field 2 and at 4 p.m. Grand Champions plays Colorado at Valiente Polo Farm Field 3. Pablo Spinacci of Mandarina outraces Juan Martin Nero of Grand Champions. Grant Ganzi looks for the big hit downfield. Juancito Bollini of Grand Champions hits away downfield.